How many times have you driven in bumper to bumper traffic on the 5 north? For me, a million times! In order to take the edge off I choose landmarks along the way to look forward to. One of my favorite landmarks is The Discovery Science Center (DSC) off Main Street. If you don’t know the name then maybe the giant black cube that has dinosaurs on the base would be an indicator as to what I am talking about. 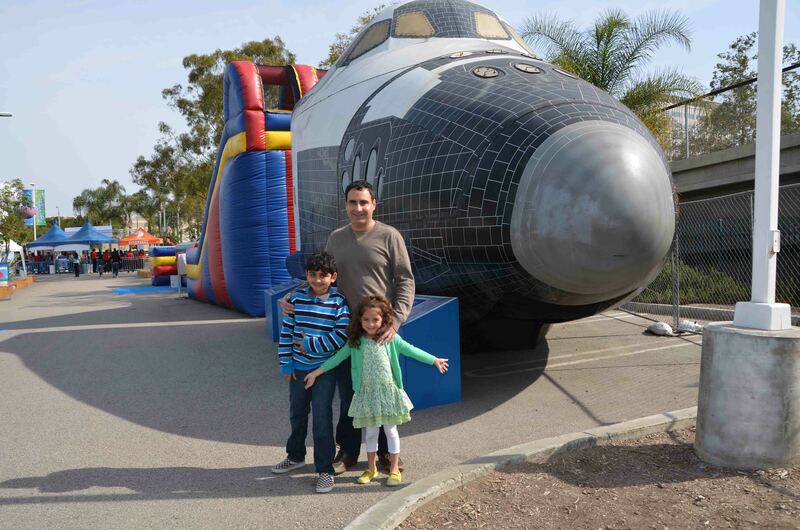 I love the DSC; they keep me and my family busy with all their events and special exhibits. My kids love the Cube and have no idea that while they play they are actually learning about science. 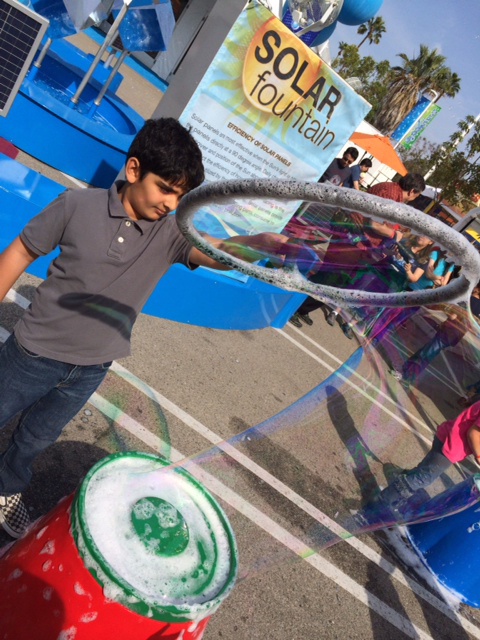 They have year round exhibits like the Boeing Rocket Lab and Eco Challenge or traveling ones like, my favorite, Bubblefest! Before I get to Bubblefest XVIII, let me tell you about the amazing offer that the DSC is having March 28-April 21. Seriously if you have any interest in acquiring a family annual pass to the DSC you need to go NOW! The DSC is currently offering a second year of membership for just $25 with the purchase of a regularly priced annual family membership at $99!!! No this wasn’t a typo $25! So for about $125 you get 2 years of DSC fun! For all of you who are current DSC members it’s just $25! 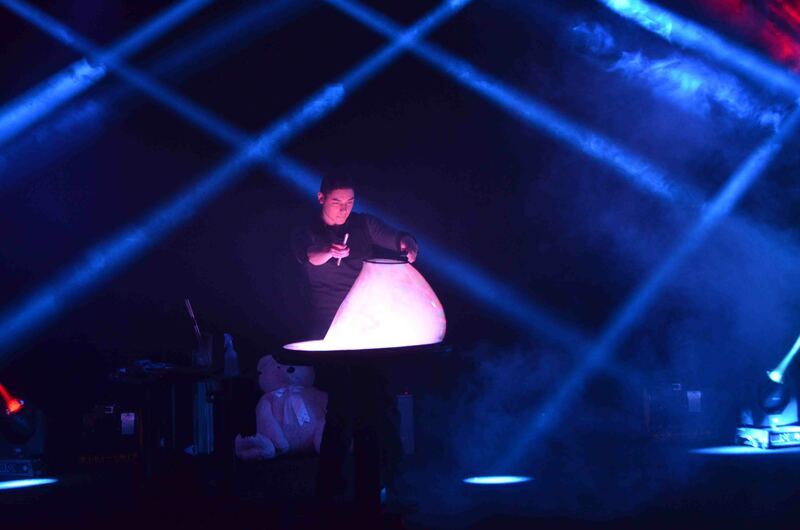 If you haven’t jumped in your cars already and heading to the DSC, then you probably want to hear more about Bubblefest XVIII (I totally understand if you want to stop reading at this point to go to the DSC and then come back to read about our Bubblefest XVIII experience). 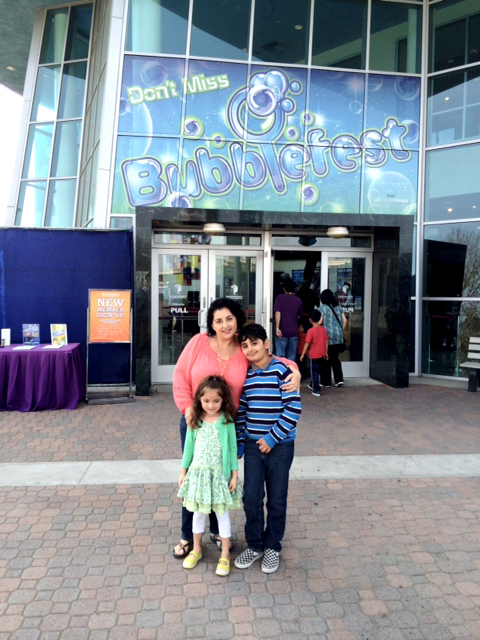 Bubblefest is a bubbleliciously fabulous experience (yes bubbleliciously is a word). 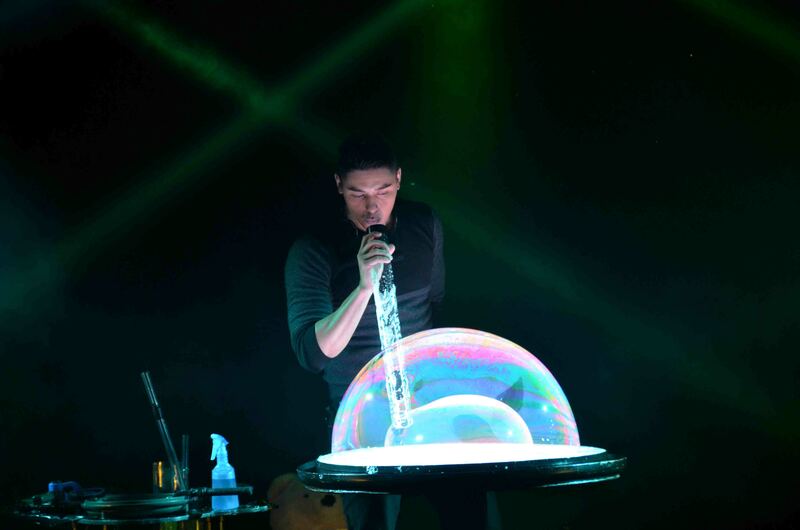 Bubbleologist Deni Yang combines entertainment, art and science is his spectacular performance of bubbles and lasers. 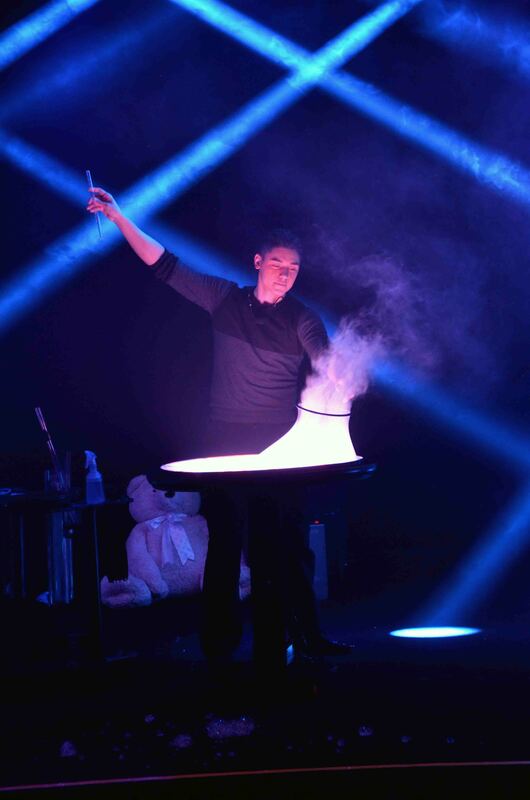 His mission is to dazzle the audience with interactive bubble display, spellbinding lasers, spectacular lighting effects, and jaw-dropping masterpieces of bubble artistry. It will make you smile, laugh, and feel like a kid all over again! I suggest arriving early because Bubblefest does sell out. It is one of DSC’s most popular shows and I have in the past missed out because I didn’t purchase my ticket ahead of time. 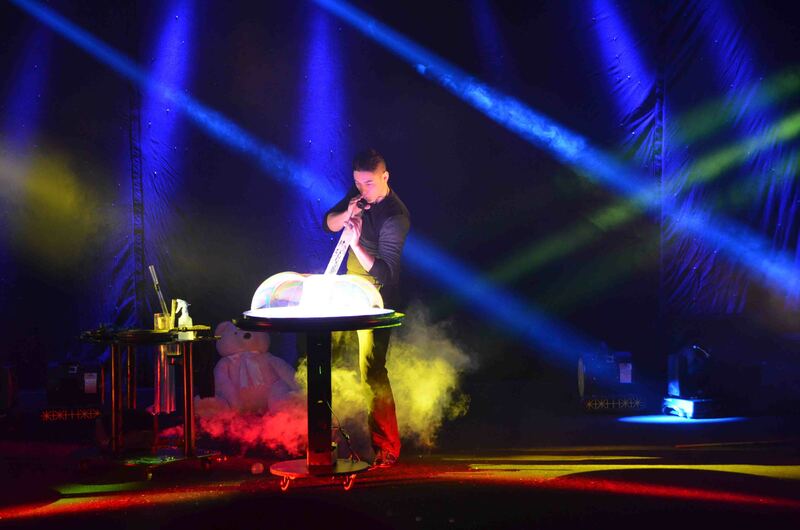 The team at DSC has the bubble experience to the next level with a hands-on bubble zone where kids can try their hand at creating giant bubbles and learn about the science behind the amazing Mega Bubblefest Laser Show. 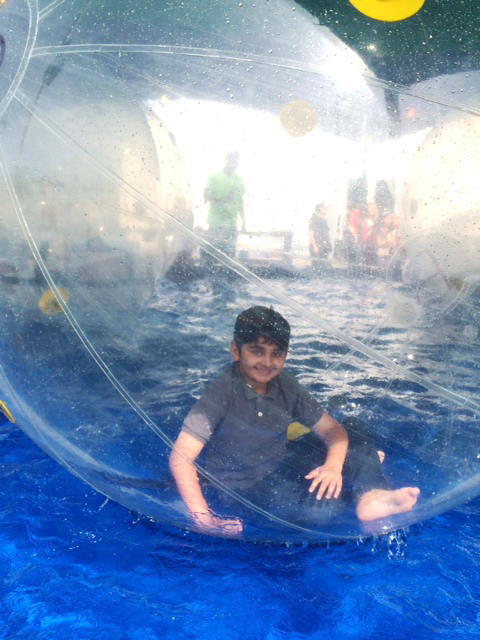 They also have an inflatable play zone and my kid’s favorite area the Water Sphere. 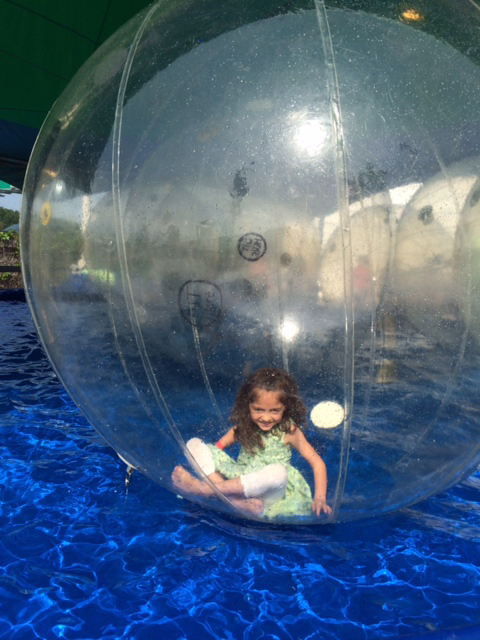 Seriously nothing more fun than bouncing around in a giant ball of air on top of water. I was so jealous! 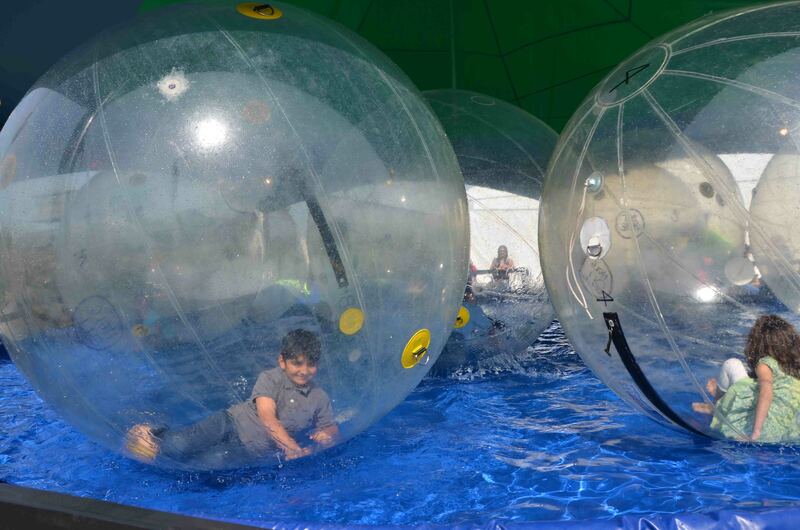 As you step into the bubble arena, you have the option of sitting on the bleachers with your children or having your children sit in a designated child zone of fun while you sit back at the bleachers and enjoy the show. 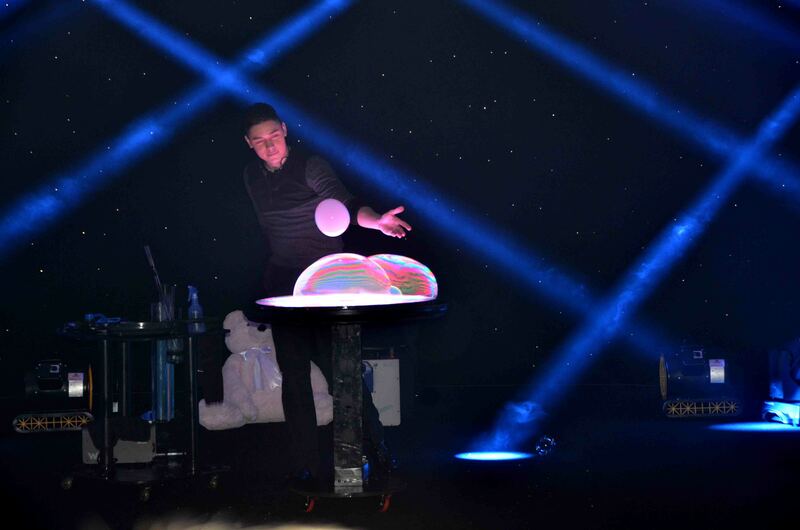 The designated child zone allows the children to jump up and grab bubbles as they float out to the audience. If you sit in the bleachers than chances are your child won’t get to chase bubbles. Deni also likes to pick out a couple of participants per show and usually picks from the child zone so if your child wants to try and go on stage with him, I recommend sitting in the child zone. Once the lights go out, it’s all about screams of joy and exclamations of awe. 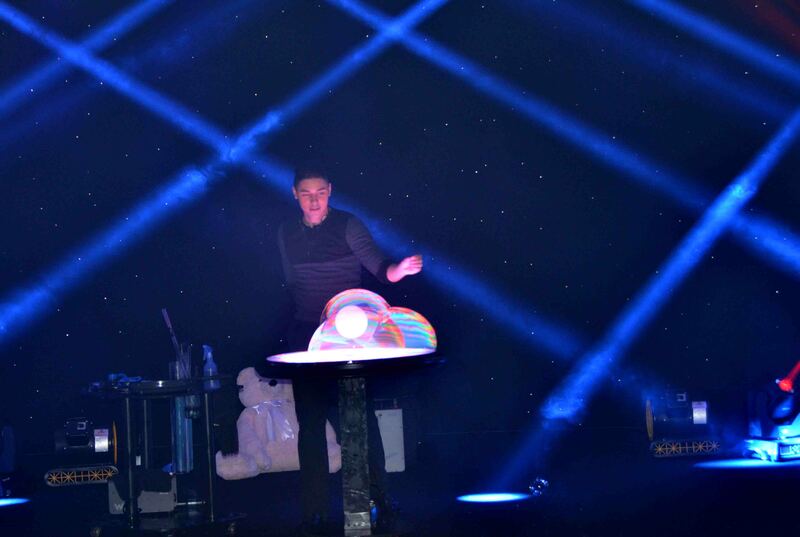 For about 45 minutes you are wowed by various bubble tricks that leave you speechless such as smoking bubbles, spinning bubbles, bouncing bubbles and so much more. 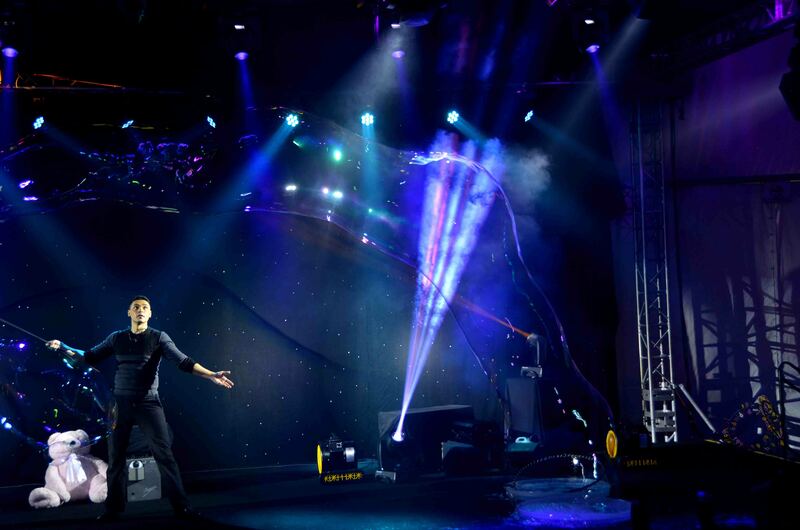 To end the show the audience gets bombarded by a firework of bubbles in synch with a magnificent light show. You need to experience it to understand the beauty of Deni’s work. 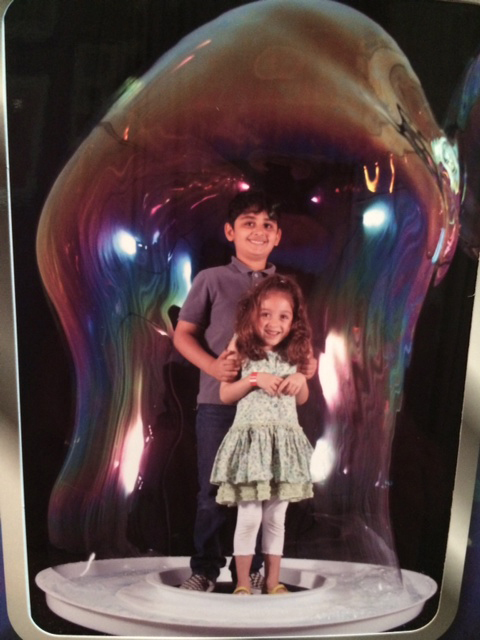 After the show you can get your picture taken in a giant bubble which even I couldn’t resist. 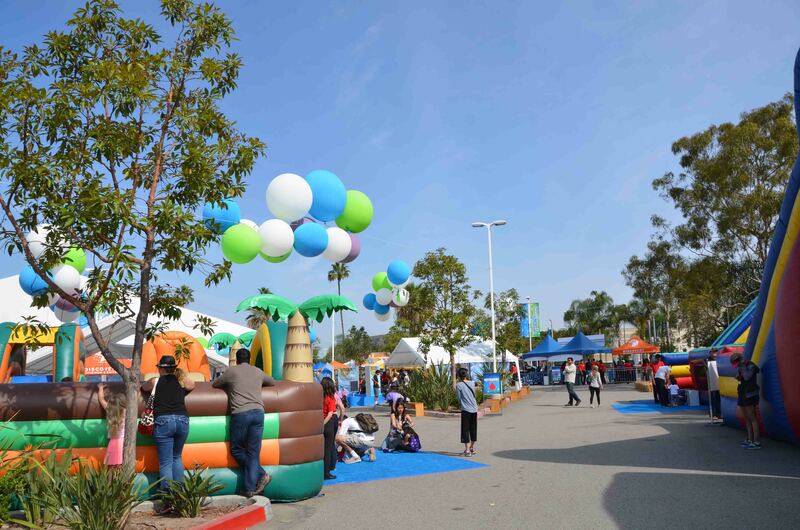 If you would like more information about The Discovery Science Center, please go to http://www.discoverycube.org/. 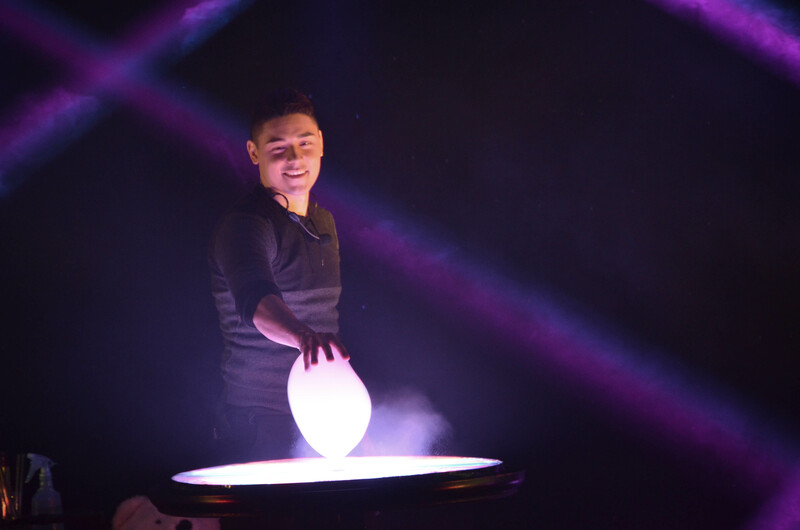 For information on Deni Yang you can visit his website at http://gazillionbubbleshow.com.